THE JEFF HEALEY BAND RECEIVED MANY RAVE REVIEWS, and here is another! The band's terrific album Legacy: Volume One is now available in a wonderful and extensive package containing two CDs and one DVD  a superb musical outing for Jeff's great vocals that is laden with many melodic treats. The DVD is a visual delight that gets you closer to the man and the band. Jeff Healey is one of the world's most celebrated guitarists and he had to be seen in action to be believed. Formed in 1985 when bassist Joe Rockman and drummer Tom Stephen joined Toronto-born Jeff, The Jeff Healey Band saw a debut album See The Light released in 1988 on Arista. Featuring impressive hit single Angel Eyes, this first album was a stepping stone to a success endorsed with a Grammy nomination, Juno Award, platinum records and a prediction from Stevie Ray Vaughan that Jeff Healey would "revolutionize the way the guitar can be played". The rest, of course, is history  and it is a history that is still continuing after Jeff's tragically early death from cancer last year (2008), twenty-three days before his 42nd birthday. 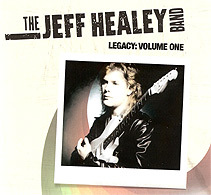 The Jeff Healey Band's Legacy: Volume One is an absolute gem of a presentation with an extensive mix of singles, unreleased live recordings and live video, interviews and candid shots documenting the amazing career and accomplishments of the Jeff Healey Band. What a tribute to Jeff's astounding talent and incredible musical accomplishments! His sell-out concerts included performances in front of Prime Ministers and Presidents and HM Queen Elizabeth of England. It is not surprising that the band was seen as one of Canada's most successful exports. Each track on the first disc (the Hits, the Best and the Rarities) is notable for its own merit but Confidence Man and Angel Eyes are particularly pleasing. While My Guitar Gently Weeps is poignantly beautiful, with Jeff wringing out every morsel of emotion; Cruel Little Number is a great little number; and Full Circle makes you realise what this brand of rock is all about. Although we liked Lost In Your Eyes very much, Angel shines brilliantly and Stuck In The Middle With You is an old favourite that everyone likes to sing along to. Moving onto the second disc that features live performances that have never been released, I Think I Love You Too Much could never get enough of an airing and Life Beyond The Sky is really wonderful rock and a truly memorable track. Particularly impressive is the Jeff Healey Band's version of All Along The Watchtower, Bob Dylan's fine creation that was also magnificently covered by the legendary Jimi Hendrix Experience. Love it and, of course, How Long Can A Man Be Strong, which is a fine example of Jeff's art. The third disc, the DVD, is a collective 'Rock-u-mentary' of rare footage, interviews, intimate behind-the-scenes moments and unseen live performances around the world from the eighteen-year career of the Jeff Healey Band  including collaborations and jams with the likes of Stevie Ray Vaughan, Eric Clapton, The Rolling Stones, Tina Turner, Keith Richards, Sheila E, Clarence Clemons (Bruce Springsteen), Paul Shaffer and Dave Edmonds as well as select music videos featuring the not previously released I Tried. Both the album and the DVD really get under your skin. It is a real pleasure to watch the highlights on screen and feel part of the musical experience. How such a 'together' kind of band could almost have slipped through the music net is beyond belief. If Jeff Healey was missing from my collection, it would not be complete. Jeff was a charismatic and talented musician who, along with the band, much deserves his place in music history.  The Jeff Healey Band's Legacy: Volume One, on earMUSIC via Absolute, is available now (released 1 June, 2009). 1 I Think I Love You Too Much | 2 Confidence Man | 3 Full Circle | 4 Life Beyond The Sky | 5 Angel | 6 See The Light | 7 While My Guitar Gently Weeps (Live at Electric Ladyland, NYC) | 8 Further On Up The Road | 9 Billie Jean Blues | 10 I Need To Be Loved | 11 White Room (Live in New York) | 12 Don't Let Your Chance Go By (Live in Toronto's Diamond Club) | 13 All Along The Watchtower (featuring Tom Cochrane, Live in Toronto's Massey Hall) | 14 My Little Girl | 15 How Long Can A Man Be Strong | 16 Can't Get My Hands On You (Live in London's Hammersmith Odeon). It was at Grossman's Tavern in Toronto when Jeff played guitar with drummer Tom Stephen that the Jeff Healey Band was born. The Jazz and Blues-Rock guitarist and vocalist just had to be noticed and when his native Canada failed to recognise his talent he took his band to the US, where the seeds of success were sown. During his nearly two-decade long career, he also discovered and helped other artistes in their development. Born on 25 March, 1966, Jeff began his musical journey at an early age. Although he lost his sight to a rare cancer of the eyes when he was just eight months old, he saw his blindness as being part of him and courageously accepted it. At the age of three he was handed a guitar and his musical capabilities quickly emerged. Jeff Healey died on 2 March, 2008, after a lifelong battle with cancer, leaving his wife, Cristie, and two children. One month later, the Mess Of Blues album was released  Jeff's first rock/blues album for eight years. He will be sadly missed.